You can see the builder wheel products on pages 8-9 of the summer mini. They were so fun to use. After putting your wheel together, you do your wheeln' on a strip of white card stock and then punch out your circle. Simple as that. There's another video idea! I still haven't tried my hand at video taping. Yes, it's on my To Do list. Have a blessed day and see you manana. Great card! I really love those colors tomorrow, will have to try that sometime! 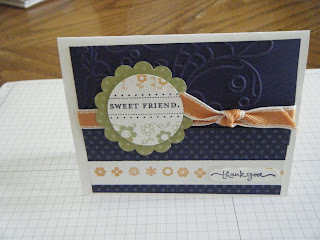 I'm following you from Stampin' Connection. I hope you have time to hop over and follow me. Such a lovely blog. I especially love your card in this post. TFS! Now following from SC. I really like your color combo! Very pretty combination. very pretty. Following through SC. Thank you for sharing and God Bless. SWEET! This is a great card! I love it. That's a wonderful color combination. What a sweet card. This is a great card as are so many others on your blog - had a hard time picking one to leave a comment! :) I just signed up to follow you. Thanks for blessing my day.